We made an expedition to the Bigloo at the Walker this afternoon. 4-yr-old J. and I stopped by Saturday and met the folks from Machine Project who are using the igloo/Bigloo as a performance space – we had some tea, watched the steam rise, and listened to a poem and the pinging kettles. We were the first visitors, and they weren’t quite ready for us – J. barely spoke, and just watched everything with very big eyes. It made an impression though, and she agreed that we really needed to come back on Sunday with her brother and dad. And so we were back on Sunday, the first ones in line. June recognized the artists and remembered their names – and noted that she had a dream about Joshua reading a poem. And the igloo/Bigloo was just as lovely the second time around. While waiting for our tea, I asked Chris Kallmyer about how the project was going. He mentioned that they always see lots of kids at public events like the one at Bigloo. I am usually most interested in how to get kids interested in contemporary art, but this made me wonder about getting adults involved. 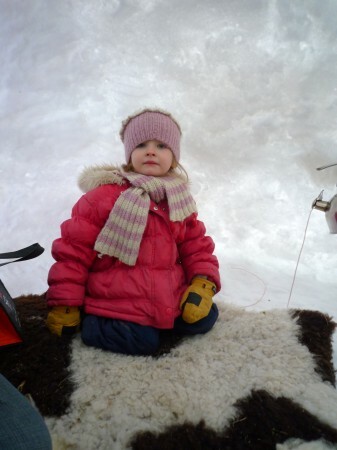 Is it easier to trek across the snow and crawl through the door of an igloo without knowing exactly what will happen inside if you’re with a four-year-old? Is it easier to relax, and chat, and enjoy the light, the cold, and the tea you’re sharing with a woman in a bear costume if your kid is mesmerized?